Jeff Simpson is a writer and poet based in Brooklyn. He was born and raised in southwest Oklahoma and received his MFA in poetry from Oklahoma State University. He is the author of Vertical Hold (Steel Toe Books, 2011), which was a finalist for The National Poetry Series and Drake University's Emerging Writer Award. He has published poems in dozens of literary journals, including Prairie Schooner; Copper Nickel; H_NGM_N; Harpur Palate; and Forklift, Ohio. His articles articles have appeared in Oklahoma Living, Martin: A Journal of Acoustic Guitars, and Edible East End. In 2010, he founded the online arts and literature magazine The Fiddleback and served as editor-in-chief for its entire run (2010-2013). He has taught writing at several colleges and universities and has worked for both Poets & Writers Magazine and the Academy of American Poets. 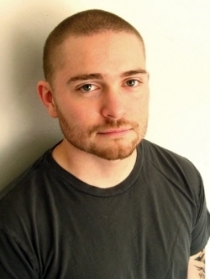 He's currently a freelance writer and is working on several, book-length projects.